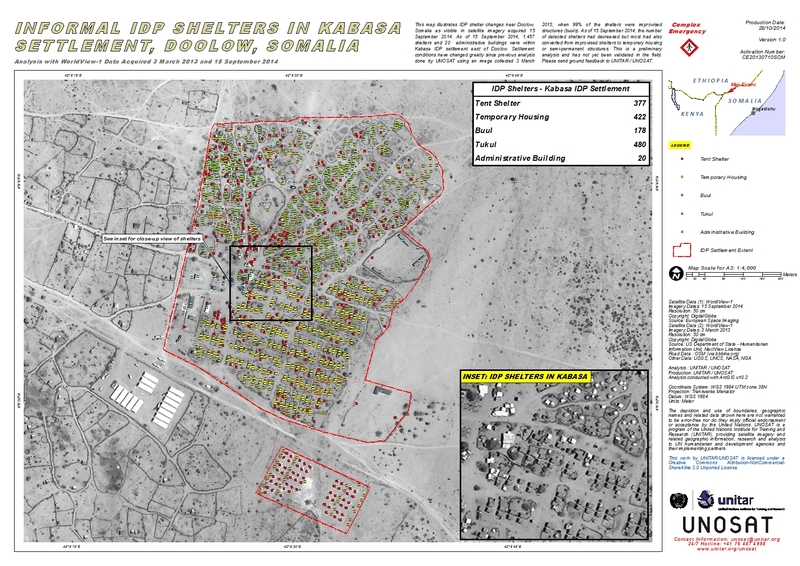 This map illustrates IDP shelter changes near Doolow, Somalia as visible in satellite imagery acquired 15 September 2014. As of 15 September 2014, 1,457 shelters and 20 administrative buildings were within Kabasa IDP settlement east of Doolow. Settlement conditions have changed greatly since previous analysis done by UNOSAT using an image collected 3 March 2013, when 99% of the shelters were improvised structures (buuls). As of 15 September 2014, the number of detected shelters had decreased but most had also converted from improvised shelters to temporary housing or semi-permanent structures. This is a preliminary analysis and has not yet been validated in the field. Please send ground feedback to UNITAR / UNOSAT.